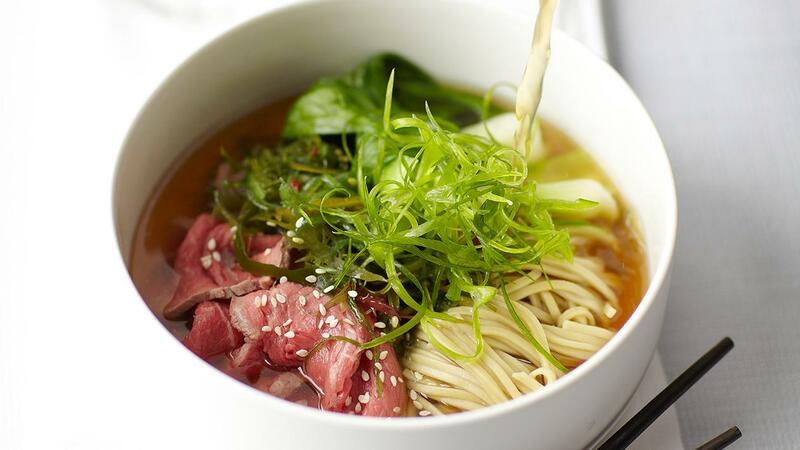 This dish is inspired by the classic Japanese soba noodles. You can also add thin slices of beef tenderloin to the broth. Bring 4 litres of water to a boil and add the beef broth and bonito flakes. Finely cut the green parts of the spring onions and leave them in ice water. Clean the rest of the spring onions and cut them into small rings. Twirl the noodles around a fork and place in bowls. Divide the bok choy, snow peas, spring onion rings over the bowls and add the green of the spring onions on top. Top the dish off with a sprinkle of sesame seeds, nori and wasabi julienne. Cut tenderloin into thinly slice.